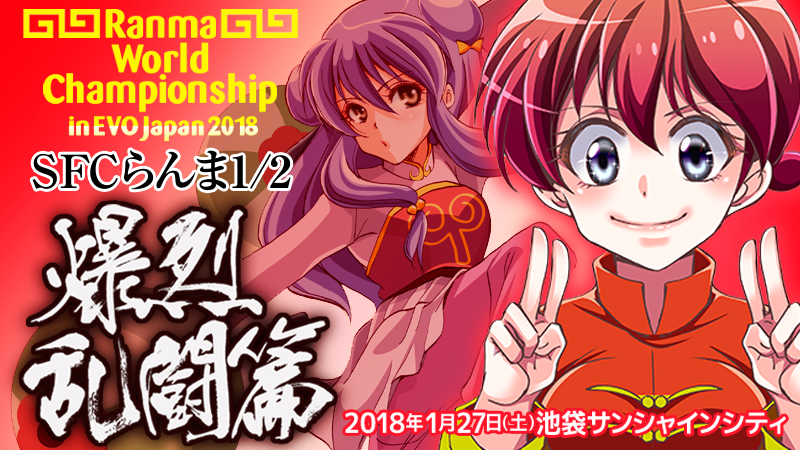 EvoJapan2018で『らんま1/2爆烈乱闘篇』が稼動！ サイドイベントとして、ダブルイリミネーショントーナメントを開催します！ 事前エントリーを強く推奨します。 Ranma1/2 BAKURETURANTOUHEN(Hard Battle) 1on1 double elimination tournament will be held as a side event of EVO Japan 2018. We expect on the day registration but it will be very few. We need to determine the tournament format in advance. So please cooperate with pre-entry. At that time we will accept entries. However, it may end depending on the number of people. Pre-entry player. Please check in by one time(15:30-16:45). To pre-entry players. Please be sure to check in. You will not be disqualified even if you are not at the start time of the tournament. I will give consideration. To Ranma or not to Ranma, that is the question. Can not change the character during battle(the round).Changes are possible after the match. Secret character(Happosay) can select. OK. Please Tell me to operate before the match up. After telling. Character change is not possible. Character change during battle is not possible.Changes are possible after the match. Please inform the operation of the failure of the controller.It is a re-game. Declaration after game is impossible.False declaration, disqualification if it prevents progress. The mistake of pressing the start button shall lose 1 round. The controller uses genuine products. Can bring your own controller.Joystick OK. Controllers with macro functions are prohibited. Rapid Fire Controller is available. Turn off Rapid Fire Mode. If you find ON, you are disqualified. Unblockable bugs. Damage is added. Available. However, it is prohibited to use bugs that will make it impossible to continue the game. In case of other troubles, follow the judgment of the organizer or operator. On the day we will broadcast on Twitch. I will shoot the picture of the tournament. I will upload it on the website or SNS at a later date. We are planning to publish videos on Nico Nico video or on youtube. Please manage the luggage / valuables individually. With regard to lost or stolen, we will not be held responsible at this opponent. I will hand you a name tag. The name tag is proof of participation. Please bring it to the end.